Approximately one in six drivers across the United States may be driving uninsured by 2010, according to a recent study from Insurance Research Council (IRC). Although the estimated percentage of uninsured motorists decreased nationally, from 14.9 percent in 2003 to 13.8 percent in 2007, the recent economic downturn is expected to trigger a sharp rise in the uninsured motorist rate. The recently released study, Uninsured Motorists, 2008 Edition, estimates the percentage of uninsured drivers countrywide and by state for the period 2005 to 2007. The IRC estimates the uninsured driver population using a ratio of insurance claims made by individuals who were injured by uninsured drivers to claims made by individuals who were injured by insured drivers. The study contains recent statistics by state on uninsured motorists claim frequency, bodily injury liability claim frequency, and the ratio of uninsured motorists to bodily injury claim frequencies. A new study by the Insurance Research Council (IRC) estimates that claim fraud and buildup added between $4.8 billion and $6.8 billion in excess payments to auto injury insurance claims closed with payment in 2007. The excess payments amount to between 13 percent and 18 percent of total payments under the five main private passenger auto injury coverages. Excess payments have increased from 2002, when they were estimated at between $4.3 billion and $5.8 billion, or between 11 and 15 percent of total payments. The percentage of claims that appeared to involve fraud, defined as specific material misrepresentation of the facts of a loss, increased from 9 percent of bodily injury (BI) claims closed with payment in 2002 to 11 percent of closed claims in 2007. 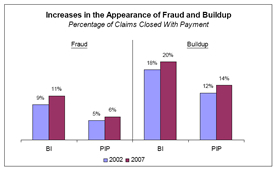 The percentage of personal injury protection (PIP) claims with apparent fraud rose slightly, from 5 percent in 2002 to 6 percent in 2007. 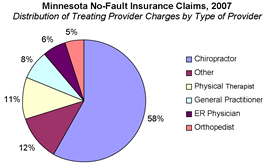 Chiropractors now account for a greater share of total provider charges in Minnesota's no-fault insurance system than all other types of treating providers combined. According to a new study from the Insurance Research Council (IRC), 58 percent of all provider charges for treatment of no-fault insurance claimants in 2007 were from chiropractors. In a study conducted five years earlier, IRC found that 41 percent of all treatment charges were from chiropractors. The recently released study, Analysis of No-Fault Auto Insurance Claims in Minnesota, is based on a detailed review of more than 500 personal injury protection (PIP) insurance claims closed with payment in 2007. The claims were among the 42,038 claims examined in the IRC's countrywide report, Auto Injury Insurance Claims: Countrywide Patterns in Treatment, Cost, and Compensation. The growing cost of chiropractic treatment in Minnesota's auto insurance system is attributable primarily to rapid growth in average charges per visit to chiropractor offices. Between 2002 and 2007, average chiropractor charges in Minnesota increased 30 percent, from $122 to $158 per visit. In addition, the percentage of PIP claimants receiving chiropractor treatment increased approximately 5 percent. Minnesota had the third highest utilization rate for chiropractors (42 percent) among 17 states with no-fault insurance claims. Only Washington and Florida had higher chiropractor utilization rates in 2007. Colorado auto insurance regulations changed from a no-fault system to a tort-based system in 2003. This IRC report examines auto claim frequencies and loss costs in Colorado before and after the transition from no-fault to tort. Additional analyses compare closed auto injury claim details between Colorado and the United States. 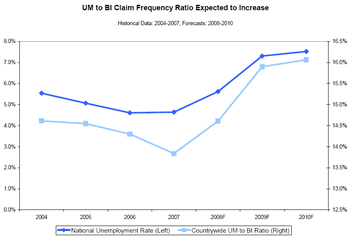 his report examines the frequency, severity, and loss costs associated with auto insurance claims under the PD, BI, and PIP coverages from 1990 to 2006. National and state statistics are provided. Also included is information on total auto injury loss costs and average written liability premiums from 1990 to 2004. This closed claim study updates the IRC’s ongoing research on injuries in auto accidents based on a sample of more than 42,000 auto injury claims paid by major auto insurers countrywide. The report explores auto injury claim patterns under each of the five principal private passenger coverages, comparing 2007 data to results from similar studies conducted in 2002 and earlier. The study examines trends in injury claim patterns, including characteristics of the accidents and those injured, medical treatment, losses and payments, the claim settlement process, and the impact of attorney involvement. This IRC report investigates the utilization and cost of alternative medical treatment in BI and PIP auto insurance claims. The report also documents the wide variation in the utilization of alternative treatment in different states.